Te Contei Restaurant is a beautiful Joomla responsive restaurant template created by Demente Design, and featured at ThemeForest. If you want a template that differs from all others with a unique, elegant layout style, Te Contei Restaurant is a great choice for you. Its layout will amaze you and your visitors because it is very unique and beautiful. A nice background with a retro pattern complements the content area which looks like an open book. With many stylish, cute details, this layout is a jackpot if you are looking for something that will attract the attention of anyone who checks out your website. A nice slider is added and it represents the perfect spot for showcasing photos of your delicacies along with short description text about each photo. These descriptions will be linked to your post pages, and by clicking them, your visitors will be taken to a page where they can read all about the delight they saw in the photo. Your opening hours can be displayed on your homepage as well, and most importantly, a nice welcoming note will warm your visitors’ hearts and make them feel cozy and comfortable when they think about your place. Follow the welcoming note with a nice photo of your restaurant and tell people a little something about your cuisine and you’ll have your winning combination for great advertising! You will be able to feature various posts on your homepage at the very bottom, no matter if it’s your recent posts or anything else you would like to point your visitors’ attention to. Social integration is nicely done, with nice buttons added for the most popular social networks, allowing you to connect your website to them and get endless sharing possibilities. 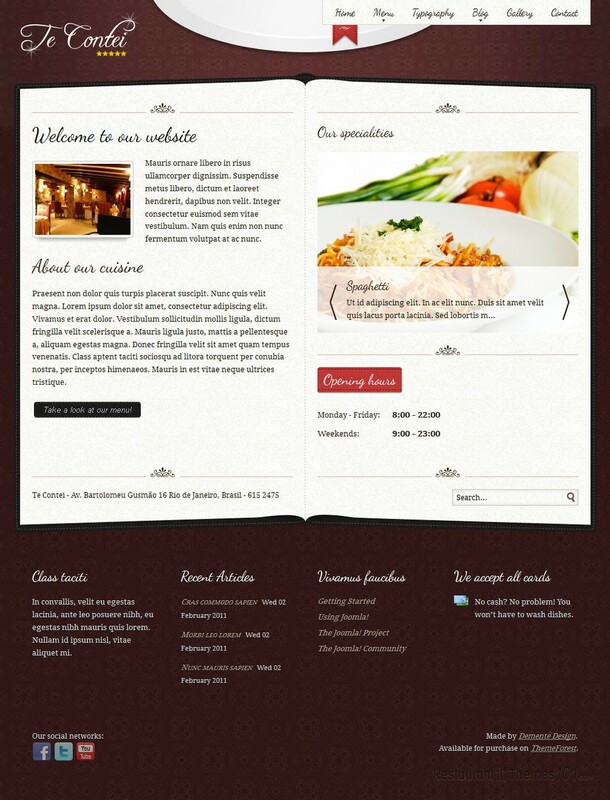 This great restaurant template for Joomla doesn’t only look good; its features are amazing as well. 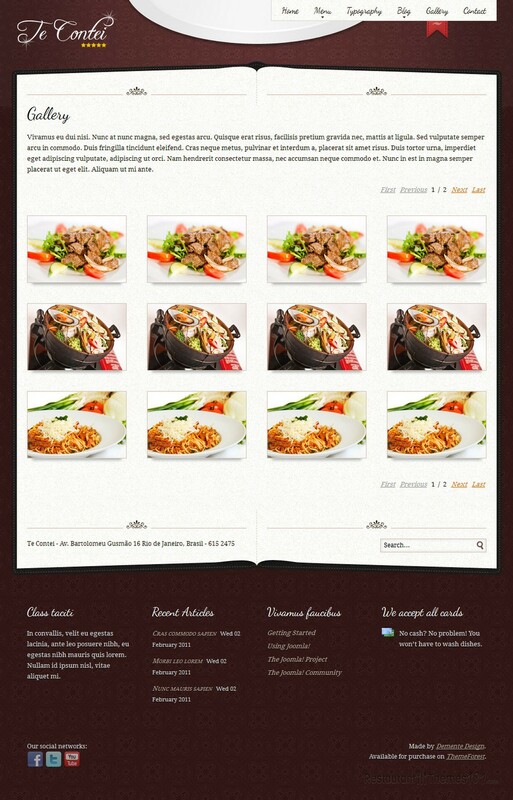 PSDs are included for easy customization, several great jQuery enhancements are featured, and it is SEO friendly. 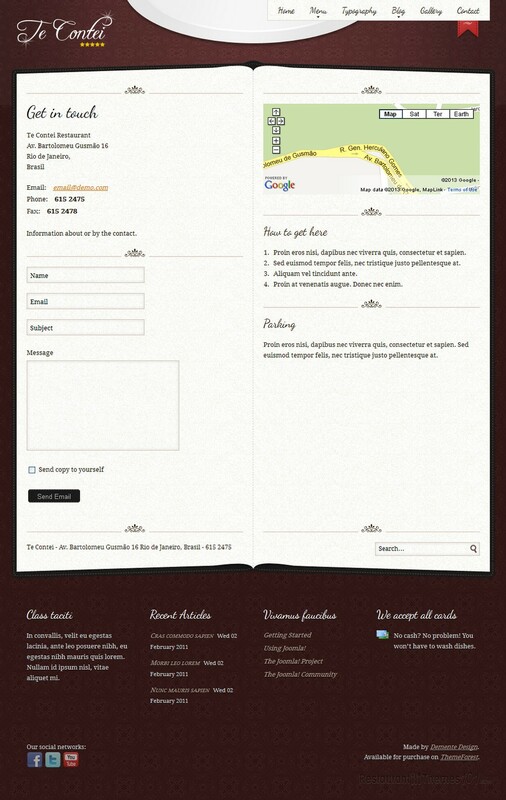 The template is also fully responsive, making sure your website looks fabulous no matter what device it is seen from. 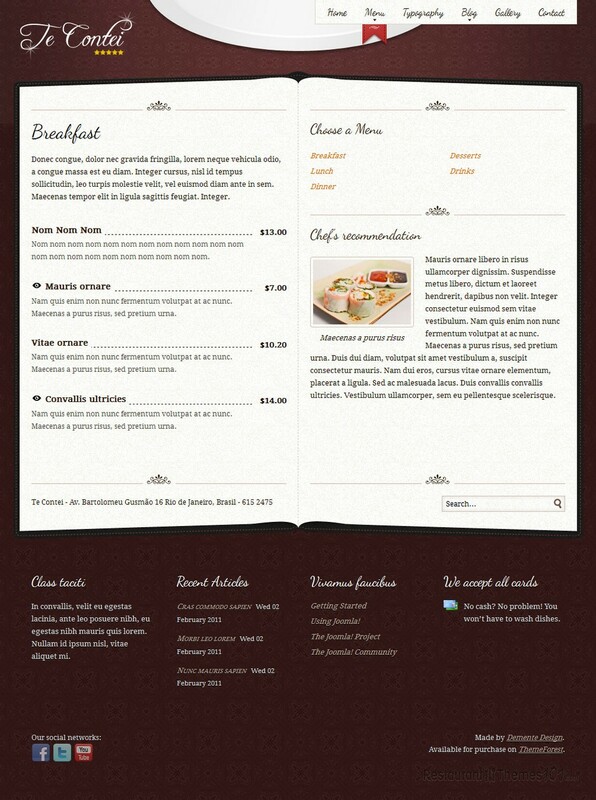 Besides this Joomla template you can buy Te Contei also as a HTML template. welcome to Restaurant Themes 101! We can help you! We will install WordPress for you and configure your installation for optimal performance. And the best thing, it's free! For more information you should read our free WordPress installation service page, your website can be online within 24 hours! subscribe to our newsletter and receive the latest theme updates, WordPress coupon codes, read in-depth plugin and theme reviews, and win great WordPress gear in our giveaways! You will not be spammed and we will *not* share your address with *anyone*, your email address will be kept completely confidential. text and image copyright © 2013-2017 RestaurantThemes101.com - all rights reserved. logos copyright or trademarked by their respective companies and organizations.